The Galaxy S10 won't be the Samsung's first triple camera smartphone but it will be its best. It's been long rumored that the Samsung Galaxy S10 would be a triple-camera threat and now new leaks confirm that this is set to be the case. UPDATE: The Samsung Galaxy S10 has officially launched. You can read all about it in our Hands on: Samsung Galaxy S10 camera review. The Samsung Galaxy S10 won't be the first triple-camera smartphone on the market, that was the Huawei P20 Pro. It won't even be the first three-camera phone from Samsung - it announced the Samsung Galaxy A7 recently and that has a trio of camera smarts. But this is the Samsung Galaxy S10 - Samsung's most important phone so expect the optics to be something special, even if it isn't quite the five cameras that some were predicting from the phone maker. The leak by SamMobile reckons that the same Galaxy S9 12MP f1.5/2.4 variable aperture lens will make up the main camera. This will be backed up by a wide-angle 16MP sensor with f1.9 aperture that has a 123-degree field of view. A 13MP f2.4 aperture sensor will be third lens in this triumvirate. As is the case with this camera setup on other phones, it's thought that optical image stabilization and autofocus will not be available on the wide-angle lens. It seems that Samsung is following its own rule of thirds with this camera range, with news that there may well be three Samsung Galaxy S10 models - the cheapest of the bunch may well only come with a single camera on its rear. This leaves the middle of the range to have two cameras and the top-line S10 to sport three lenses. 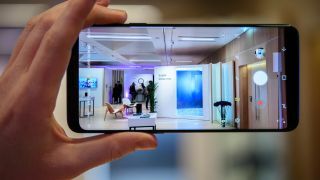 The Samsung Galaxy S10 is set for release in early 2019 where it will join the super camera phone ranks, alongside the Huawei P20 Pro, Samsung Galaxy A7 and the five-lensed LG V40 ThinQ. Best camera phone: these are the phones that are packed with camera goodness.